Big Dogs of the world, it’s time to stop living in fear and start wearing your attitude on your sleeves, chests, and hearts once again. Get the pack together, it’s time to run. P.S. – Thanks so much to Brad for serving as my Big Dog spirit guide on this comical journey. This is one of my favorite loldwells ever. AWESOME. 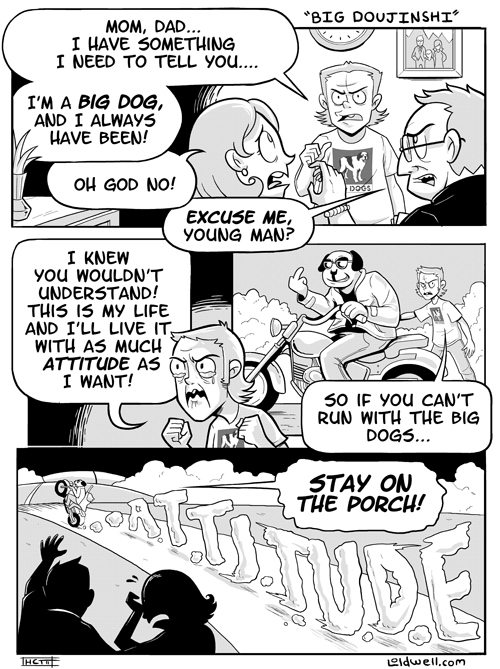 I’m pretty sure everyone’s had a Big Dog shirt at some point. Memories. Never stop LIVIN’ LARGE bruther. It was designed for laughter! I win! Oh man I LOVE Mr. Heavenly!